“It felt to me to be a well-balanced risk on my side when we were going through the process." A generation of successful people are reaching retirement and asking the question: What do I do next? When it came to funding their unexpected alternative to retirement Keith was in for another surprise. He was later to discover that he could have avoided dipping into his pension pot and paying “stupid rates of tax”, he could have borrowed from it instead. Keith and Sue joined the new generation of start-ups on one of the oldest streets in York, launching a business on the historic Shambles in York, a medieval street mentioned in the Doomsday Book with overhanging timber-frame buildings dating back to the 14th century and a magnet for tourists. The early years running a souvenir gift shop and coffee lounge were challenging through the recession and Keith and Sue have pumped a significant amount of money into the business to keep it running. “If you hadn’t been in our position the business would have gone to the wall,” said Keith, an accountant by profession. But reacting to customer demand proved the spark they needed and for the past few years business has been booming, as a bar and restaurant. 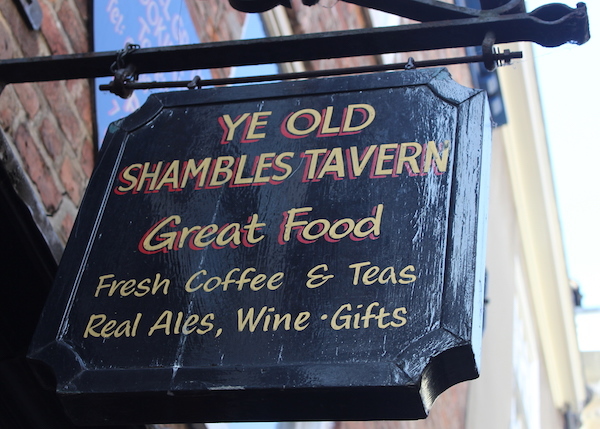 The Shambles Tavern now serves food and around 120 different Yorkshire beers seven days a week. The opportunity to use Keith’s pension pot to build on that success – and boost his pension – came at the perfect time for Keith. He was about to take more cash from his pension. “I had worn my pension away significantly by taking money at stupid rates of tax,” he said. The business needed a cash injection to upgrade the kitchen, beer dispensing system and to further develop their popular outside space in the marketplace at the rear of the building, as well as working capital and paying off their overdraft. With help from Pension-led funding Keith’s existing pension was transferred to a SIPP (Self-Invested Personal Pension) and he accessed 50 per cent of the SIPP’s value with a coupon of 15% preference shares over five years. The coupon is paid once a year and at the end of five years the business buys the shares back from the pension scheme. Keith said: “Ok, we had a bad start, we chucked money away but we are moving forward in a way that I think will pay dividends down the track. Would he recommend Pension-led funding? He has, to Sue! “It felt to me to be a well-balanced risk on my side when we were going through the process. I’m more convinced now that we are through the process,” Keith said. “I thought the concept seemed absolutely spot on. Both had impressive CVs. Following a long career as a public servant Keith was at the forefront of an operation to re-introduce general management into the Kosovo health system after the war and had taken an academic post Sheffield University. Sue was a deputy regional nursing director when Keith invited her to help him out in Kosovo. A “couple of weeks’ holiday” in the war-torn country ended with Sue becoming head of mission for the World Health Organisation and spearheading the introduction of primary care into Kosovo. They also faced a number of unique challenges closer to home as they transformed the struggling gift shop and café into the popular tavern it is today, although this was not their first customer-led business having owned a small boutique hotel in York. What started with a desire to provide the option of wine with lunch has become the renowned Shambles Tavern boasting a professional chef, a wall of Yorkshire ales in the bar, their own label brews, Shambles Stumbler, a light ale and Shambles Dark and Shambles Cider, and ambitious plans to develop further. “We pride ourselves that every time someone walks through the door they should be greeted with a smile and a happy face,” Keith said. A fear of becoming boring is driving Keith to continue working. The last few years have been anything but boring.